To say Bolivia is a wonderful yet underrated country would be an understatement, and in the heart of this picturesque country lies La Paz’s futuristic urban subway. At more than 11,000 feet above sea level, La Paz is the highest capital city in the world. With towering mountains to little terracotta slopes, the view will truly amaze you. However, if the breathtaking views of the city is not enough to make people visit, the revolutionary Mi Teleférico, or My Cable Car, will do just that. The ambitious cable car system in the La Paz-El Alto metropolitan area has been a dream of the Bolivian government for decades now. The cable car system designed by Austrian company Doppelmayr makes trips between the cities of El Alto and La Paz, which helps the people’s morning commute feel like a vacation experience. Every day, thousands of people from the Bolivian city of El Alto go to La Paz to work. Before Mi Teleférico, their travel time would usually take up a huge chunk of their day. This is because the narrow and mountainous nature of their roads are not designed to keep up with the huge number of cars. Thanks for Mi Teleférico, travel time went down by an hour and 10 minutes. The highest and longest urban cable car system in the world has three teleférico lines, which are named after the colors of the Bolivian flag: green, yellow, and red. The initial stage of the transit system was widely criticized because of the huge cost that it entailed. However, almost four years after it began its operation on May 2014, it has become a huge success. “I think the teleférico is great — my life is different now. Before, I’d travel for three or four hours just to go shopping, and it was a worry to think we’d have that long journey [back] if there was some kind of emergency. The teleférico has helped us a lot,” said Elisa Marconi, a primary school teacher, in an interview with The Guardian. “Along with striving to modernize mobility in La Paz, Mi Teleférico have also considered the system’s impact on the environment; a topic of great importance in Bolivia. 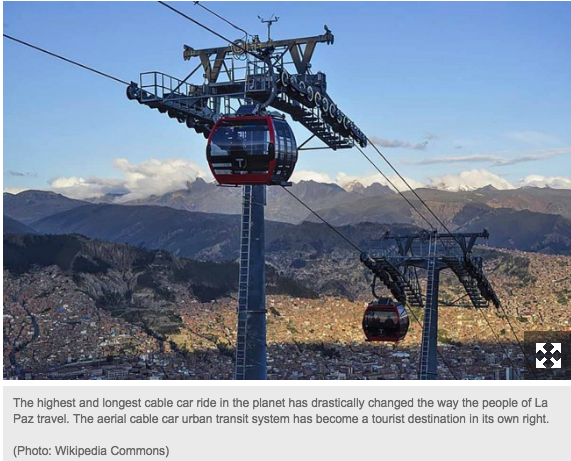 In an effort to cut the amount of smog polluting city air, the cable car system has been designed to run on electricity, part of which is provided through solar power,” according to La Paz Life. The ride costs $0.40 and is open from 6 a.m. to 11 p.m. daily. The future of La Paz’s amazing transit system is bright. La Paz Life reported that Entel, a telecommunication company in Bolivia, will provide Wi-Fi access to its customers. Additionally, Bolivia is gearing up for their goal to achieve 16 lines by 2030. People all over the world are now taking notice of Bolivia, one of the cheapest countries to migrate to. Considering its hairpin curves amid its beautiful mountainous landscape coupled with its rising development, there’s no question why.